TLA HALYNOV is a 93 3/4% Russian stallion who is Region II Jumper Champion, Halter Champion at Del Mar, and Top 5 Hunter Scottsdale in his performance debut. He also won Get of Sire Championship at Santa Barbara against the legendary KHEMOSABI++++. His offspring have been successful on the race track, on the endurance trail, and in the show ring. One of his top-winning get is 1998 U.S. Top Ten English Sidesaddle JTR and Show Hack JTR 13/Under AA ATHENA+. TLA HALYNOV has five lines to the great Russian racehorse sire PRIBOJ, as well as two lines to ASWAN, noted for his beauty, and one line each to *SALON and ARAX, both key sires in the Russian breeding program. The only outcross to the Russian breeding came from the Crabbet stud through British National Champion Mare ELOIA, a granddaughter of RAKTHA (sire of the all-time leading Crabbet sire *SERAFIX) and RISSALIX (whose son *COUNT DORSAZ is the only Crabbet stallion to sire both a U.S. National Champion Stallion and a U.S. National Champion Park Horse). TLA HALYNOV is a son of the Dutch-born halter champion *HALYCON, a successful sire of American halter champions including halter reserve champion DUTCH GOLD, 1986 Region 14 Reserve Champion Mare AMIRA KRACYVAYA, 1988 Region 14 Top Five Stallion and 1993 Region 13 Top Five Stallion FARYCON (also a 1999 Region 14 Top Five Stallion AOTH at age 17!). All of the foregoing are out of a *SALON granddaughter, as is TLA HALYNOV. *HALYCON's son DELFT BLUE is a champion endurance competitor. *HALYCON get have produced champions as well. His daughter AMIRA PARABOLA is the dam of 1993 Region 11 Top Five Western Pleasure Junior Horse FUN VALLEY GUSTO. *HALYCON has sired a total of 6 producers of National winners through 2002. His daughter AMIRA FATMA is the dam of 1996 Region 16 Champion Western Pleasure Junior Horse and 1998 Region 9 Top Five Working Cow Horse and Working Cow Horse AOTR SA DESERTSTORM and of 1992 U.S. Top Ten Futurity Mare LOST-N-FOUND, also a multi-regional halter winner and dam of 2001 Canadian Top Ten 2 Year Old Jackpot Filly LA VIDA LOCA. Another daughter, OAKKNOLL HALIANNA, is the dam of 1994 and 1996 U.S. Top Ten Reining BR MAJESTIC. The *HALYCON son PAAVO sired 1998 U.S. Top Ten English Sidesaddle JTR PAAJOE. Another *HALYCON son, PATROLON, sired 1998 U.S. Top Ten Reining Futurity PATROLONS TANGO. The *HALYCON son AVA PREBOJ sired 2000 U.S. National Champion Show Hack JTR 13/Under and Top Ten Show Hack JOTR CEBKS NAPOLEON. *HALYCON is a son of the Russian-born stallion PATRON, three times named Dutch National Champion Stallion. Other significant PATRON get include halter champion *EL KASAKA (a sire of National winners in halter and performance), 1989 Region 14 Top Five Stallion *PATTRONE(sire of 4 producers of National winners including National Champion producer VS LIFES MAGIC), 1987 Regions 1 and 2 Reserve Champion Driving *PASCHAA, 1982 Region 12 Reserve National Champion Mare *TRONCHA (dam of U.S. and Canadian Top Ten Western Pleasure and U.S. Top Ten Mare AOTH and National winner producer PONTRONA), *FAISCA JAOX (sire of U.S. Top Ten Stallion and Canadian National Champion Western Pleasure JAOXS ISHTAR), , *NDL PARIS (sire of four time National winner in hunt pleasure WKA LADY LOVE), World Champion Stallion *ABDULLAHHH (sire of World Champion Stallion AMAL), and U.S. and Canadian National Champion Stallion *PADRON (sire of over 175 champions, 55 National winners and 52 producers of National winners). PATRON is the son of Tersk chief sire ASWAN, who was born in Egypt. ASWAN sired 4 North American National winners: U.S. and Canadian Top Ten Mares *PRISTAN and *NARIADNAIA, Canadian Top Ten Stallion *NANKIN, and U.S. National Champion Stallion *MARSIANIN. 12 ASWAN sons have sired National winners in North America, including PALAS (sire of Canadian National Champion Mare *CAMEA and U.S. National Champion Mare *PENICYLINA), PIRIT (sire of Canadian National Champion Park and National Champion sire *NAPITOK+), and NUMIZMAT (sire of Canadian Reserve National Champion Western Pleasure *ACADIA). 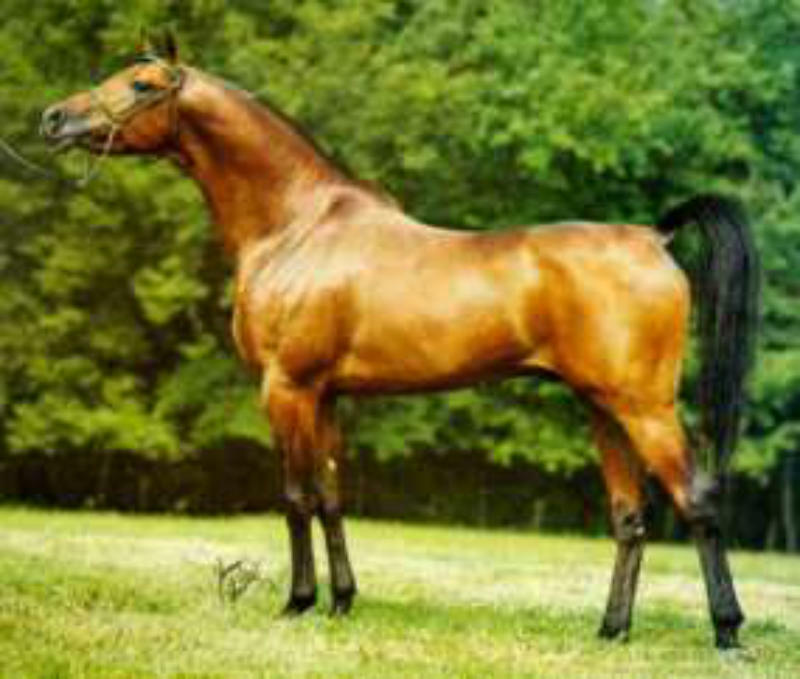 ASWAN has 10 daughters who have produced North American National winners, including PARMA (dam of Canadian Top Ten Stallion and Brazilian National Champion Stallion *POLONEZ PASB, of Polish Reserve National Champion Stallion PARTNER, of Swedish and Polish National Champion Stallion PARYS, and Polish National Champion Stallion PAMIR). PATRON is a 3/4 brother to *PLISKA, dam of Canadian National Champion Futurity Filly and National Champion producer OMBRA ROSE. PATRON's 3/4 sister *PARKETNAIA is the dam of Canadian National Champion Western Pleasure and National Champion producer NAMASKAR. PATRON's dam PODRUGA is by PRIBOJ, noted for the athletic ability of his get and grandget. PRIBOJ's son *PIETUSZOK sired 4 National winners including Canadian National Champion Stallion *BAJRAM (also a U.S. Top Ten Cutting winner), and 14 of his get have produced National winners, including *ORZEL++, a winning racehorse and a U.S. National winner in halter and performance. PRIBOJ's daughter MALPIA is the dam of U.S. and Canadian National Champion Stallion *MUSCAT, the all-time leading Russian sire of champions. Another PRIBOJ son POMERANETS (a son of MAMMONA) is the sire of Belgian National Champion Stallion *NARTAN (sire of 8 National winners), *KLIPSA (dam of Dutch National Champion Mare KLEOPATRAA), NEPRIADWA(dam of Dutch Reserve National Champion Mare *NAHODKA and of U.S. and Canadian Top Ten Stallion *NATUREL), and TRAPECIA (dam of European Champion Stallion TOP 10 and National winner sire *TAMERLAN). The POMERANETS get NEPTUN, Belgian National Champion Stallion *POBEDITEL, *KIPRIDA, *SPORTSMENKA, *NAPAIKA and *LIPA are all grandparents of North America National winners. The PRIBOJ daughter MONOPOLIA is the dam of Region 10 Top Five Park *MAGNAT and of *MONOGRAMMA, dam of U.S. Reserve National Champion Futurity Stallion and twice U.S. Top Ten Stallion MONOGRAMM, a sire of National winners in halter, English pleasure, western pleasure, and reining including U.S. Reserve National Champion Stallion CONSENSUS and 2002 U.S. National Champion Senior Mare *KWESTURA.. The PRIBOJ daughter METROPOLIA is the dam of *MENES, sire of National Champions in halter and performance in North America as well as National Champions in Europe. TLA HALYNOV is a 93 3/4% Russian stallion who is Region II Jumper Champion, Halter Champion at Del Mar, and Top 5 Hunter Scottsdale in his performance debut. He also won Get of Sire Championship at Santa Barbara against the legendary KHEMOSABI++++. His offspring have been successful on the race track, on the endurance trail, and in the show ring. One of his top- winning get is 1998 U.S. Top Ten English Sidesaddle JTR and Show Hack JTR 13/Under AA ATHENA+. TLA HALYNOV has five lines to the great Russian racehorse sire PRIBOJ, as well as two lines to ASWAN, noted for his beauty, and one line each to *SALON and ARAX, both key sires in the Russian breeding program. The only outcross to the Russian breeding came from the Crabbet stud through British National Champion Mare ELOIA, a granddaughter of RAKTHA (sire of the all-time leading Crabbet sire *SERAFIX) and RISSALIX (whose son *COUNT DORSAZ is the only Crabbet stallion to sire both a U.S. National Champion Stallion and a U.S. National Champion Park Horse). TLA HALYNOV is a son of the Dutch-born halter champion *HALYCON, a successful sire of American halter champions including halter reserve champion DUTCH GOLD, 1986 Region 14 Reserve Champion Mare AMIRA KRACYVAYA, 1988 Region 14 Top Five Stallion and 1993 Region 13 Top Five Stallion FARYCON (also a 1999 Region 14 Top Five Stallion AOTH at age 17!). All of the foregoing are out of a *SALON granddaughter, as is TLA HALYNOV. *HALYCON's son DELFT BLUE is a champion endurance competitor. *HALYCON get have produced champions as well. His daughter AMIRA PARABOLA is the dam of 1993 Region 11 Top Five Western Pleasure Junior Horse FUN VALLEY GUSTO. *HALYCON has sired a total of 6 producers of National winners through 2002. His daughter AMIRA FATMA is the dam of 1996 Region 16 Champion Western Pleasure Junior Horse and 1998 Region 9 Top Five Working Cow Horse and Working Cow Horse AOTR SA DESERTSTORM and of 1992 U.S. Top Ten Futurity Mare LOST-N-FOUND, also a multi- regional halter winner and dam of 2001 Canadian Top Ten 2 Year Old Jackpot Filly LA VIDA LOCA. Another daughter, OAKKNOLL HALIANNA, is the dam of 1994 and 1996 U.S. Top Ten Reining BR MAJESTIC. The *HALYCON son PAAVO sired 1998 U.S. Top Ten English Sidesaddle JTR PAAJOE. Another *HALYCON son, PATROLON, sired 1998 U.S. Top Ten Reining Futurity PATROLONS TANGO. The *HALYCON son AVA PREBOJ sired 2000 U.S. National Champion Show Hack JTR 13/Under and Top Ten Show Hack JOTR CEBKS NAPOLEON. *HALYCON is a son of the Russian-born stallion PATRON, three times named Dutch National Champion Stallion. Other significant PATRON get include halter champion *EL KASAKA (a sire of National winners in halter and performance), 1989 Region 14 Top Five Stallion *PATTRONE(sire of 4 producers of National winners including National Champion producer VS LIFES MAGIC), 1987 Regions 1 and 2 Reserve Champion Driving *PASCHAA, 1982 Region 12 Reserve National Champion Mare *TRONCHA (dam of U.S. and Canadian Top Ten Western Pleasure and U.S. Top Ten Mare AOTH and National winner producer PONTRONA), *FAISCA JAOX (sire of U.S. Top Ten Stallion and Canadian National Champion Western Pleasure JAOXS ISHTAR), , *NDL PARIS (sire of four time National winner in hunt pleasure WKA LADY LOVE), World Champion Stallion *ABDULLAHHH (sire of World Champion Stallion AMAL), and U.S. and Canadian National Champion Stallion *PADRON (sire of over 175 champions, 55 National winners and 52 producers of National winners). PATRON is the son of Tersk chief sire ASWAN, who was born in Egypt. ASWAN sired 4 North American National winners: U.S. and Canadian Top Ten Mares *PRISTAN and *NARIADNAIA, Canadian Top Ten Stallion *NANKIN, and U.S. National Champion Stallion *MARSIANIN. 12 ASWAN sons have sired National winners in North America, including PALAS (sire of Canadian National Champion Mare *CAMEA and U.S. National Champion Mare *PENICYLINA), PIRIT (sire of Canadian National Champion Park and National Champion sire *NAPITOK+), and NUMIZMAT (sire of Canadian Reserve National Champion Western Pleasure *ACADIA). ASWAN has 10 daughters who have produced North American National winners, including PARMA (dam of Canadian Top Ten Stallion and Brazilian National Champion Stallion *POLONEZ PASB, of Polish Reserve National Champion Stallion PARTNER, of Swedish and Polish National Champion Stallion PARYS, and Polish National Champion Stallion PAMIR). PATRON is a 3/4 brother to *PLISKA, dam of Canadian National Champion Futurity Filly and National Champion producer OMBRA ROSE. PATRON's 3/4 sister *PARKETNAIA is the dam of Canadian National Champion Western Pleasure and National Champion producer NAMASKAR. PATRON's dam PODRUGA is by PRIBOJ, noted for the athletic ability of his get and grandget. PRIBOJ's son *PIETUSZOK sired 4 National winners including Canadian National Champion Stallion *BAJRAM (also a U.S. Top Ten Cutting winner), and 14 of his get have produced National winners, including *ORZEL++, a winning racehorse and a U.S. National winner in halter and performance. PRIBOJ's daughter MALPIA is the dam of U.S. and Canadian National Champion Stallion *MUSCAT, the all- time leading Russian sire of champions. Another PRIBOJ son POMERANETS (a son of MAMMONA) is the sire of Belgian National Champion Stallion *NARTAN (sire of 8 National winners), *KLIPSA (dam of Dutch National Champion Mare KLEOPATRAA), NEPRIADWA(dam of Dutch Reserve National Champion Mare *NAHODKA and of U.S. and Canadian Top Ten Stallion *NATUREL), and TRAPECIA (dam of European Champion Stallion TOP 10 and National winner sire *TAMERLAN). The POMERANETS get NEPTUN, Belgian National Champion Stallion *POBEDITEL, *KIPRIDA, *SPORTSMENKA, *NAPAIKA and *LIPA are all grandparents of North America National winners. The PRIBOJ daughter MONOPOLIA is the dam of Region 10 Top Five Park *MAGNAT and of *MONOGRAMMA, dam of U.S. Reserve National Champion Futurity Stallion and twice U.S. Top Ten Stallion MONOGRAMM, a sire of National winners in halter, English pleasure, western pleasure, and reining including U.S. Reserve National Champion Stallion CONSENSUS and 2002 U.S. National Champion Senior Mare *KWESTURA.. The PRIBOJ daughter METROPOLIA is the dam of *MENES, sire of National Champions in halter and performance in North America as well as National Champions in Europe.